Why is Mailbird the best Alternative to Thunderbird in 2019? Change is good, even for your Email. 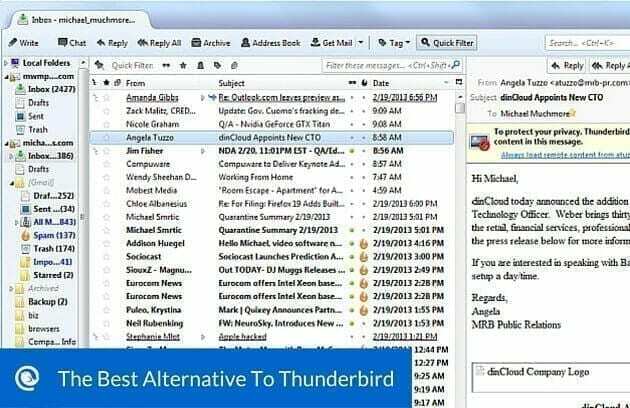 Now that Mozilla has abandoned Thunderbird, it’s time to move on to the best alternative for you to stay on top of your emails. Let’s look at why Mailbird is the best Alternative to Thunderbird for Thousands of users already. Having a clean interface in front of you coupled with an interaction that makes managing your online communication easier is a sweet deal. 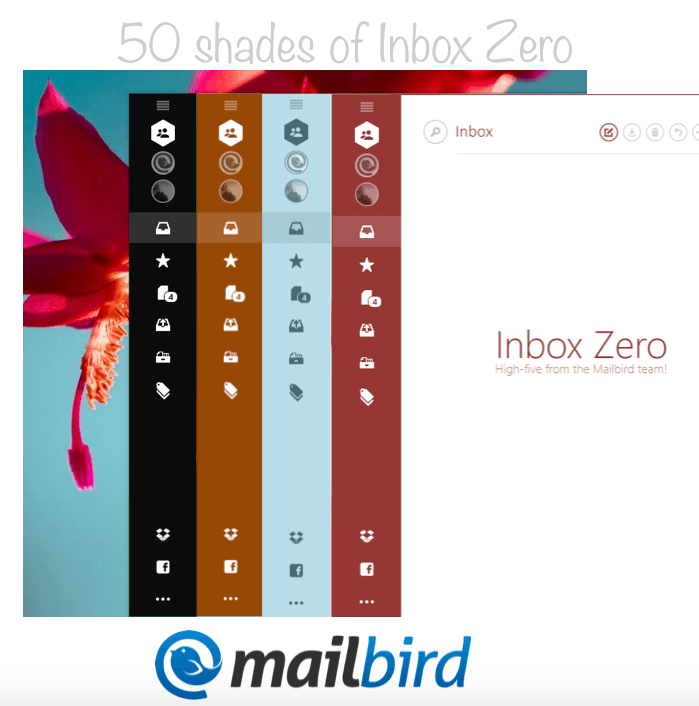 Mailbird is super easy to use and promises you will be able to master it within 5 minutes. 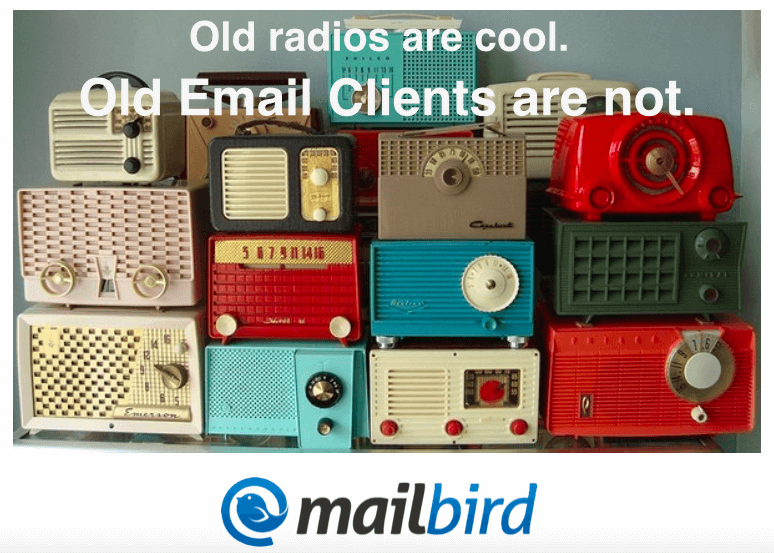 A great email experience is what you should strive for and Mailbird gives you exactly that. Thunderbird is not being updated anymore and it is known for its cluttered and bloated layout and UI, making it rather complicated for new and even existing user to handle the software. Sure, if you use a software on a daily basis you eventually learn how to get around it, in fact that’s even the case with rocket science but is that the best utilization of your time? Software and apps in 2015 should be intuitive enough to not have a learning curve so spending a few days unraveling the mystery of using an email client seems like we’re technologically pushing you back to early 2000s. Simplicity, clean UI, intuitive UX and speed are the main reasons why people try Mailbird, enabling them to master it in less than 5 Minutes (not days). User experience is the small little details that you don’t recognize consciously but intuitively guides you to use the software. And when clicked upon, opens Dropbox file explorer for you to select files to be attached. 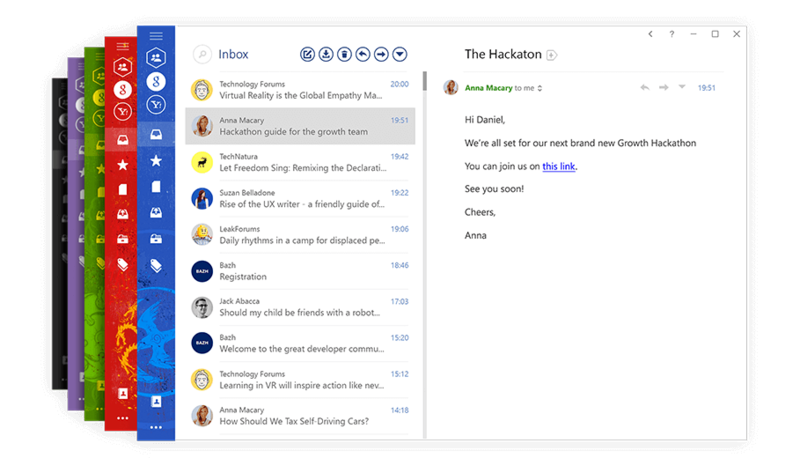 Example #2 – You might think, Mailbird does not offer as many features and functionalities as Thunderbird, otherwise the Inbox and menu would look the same, right? That is not quite correct. Instead of filling the interface with lots of buttons and options, we hid them to show up on certain user action. If you look at how emails are stacked in Mailbird, it looks just like any other email program but when you hover over the profile picture of an email message, an action bar shows up on top which makes it easier for you to deal with it. You can even click on the profile picture of an email message and it will show you all the emails you’ve exchanged with the person. In Mailbird, you can customize the layout and color theme, personalizing your Inbox. In order to find the perfect replacement for their current email client, people tend to only look for ones that have exactly the same features as their current email client, regardless of whether or not those features will actually be used. 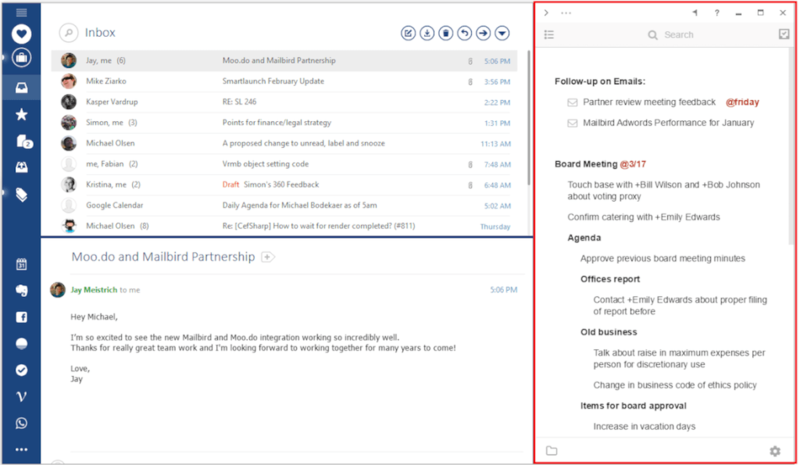 Mailbird has integrated the standard features that users know from Thunderbird and also offers special Mailbird-only features that have not yet been implemented by any other email client. Quick preview of attachments, speed reader, Linkedin lookup, snooze and many other. 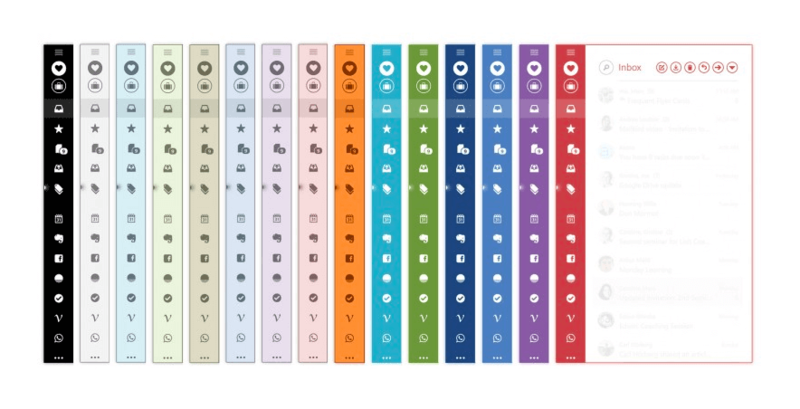 The majority of these are already available in Mailbird’s free version – Mailbird Lite. 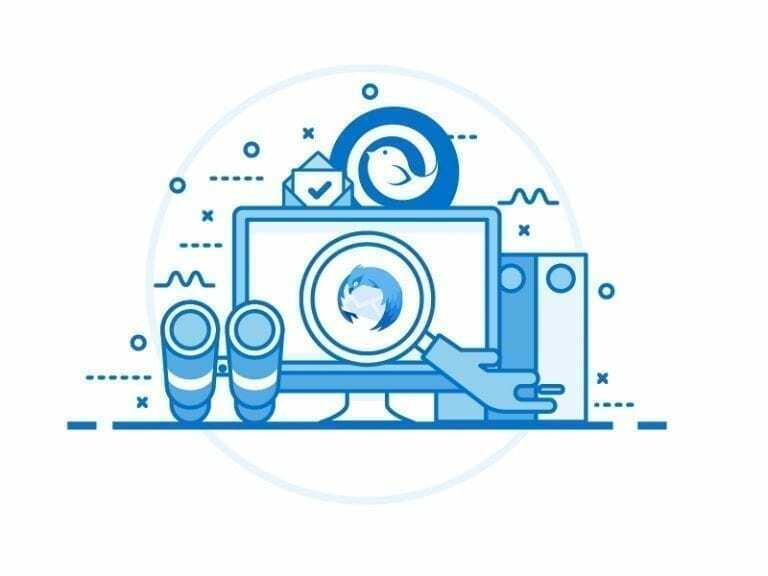 Additional features that differentiate Mailbird from other email clients is the integration of a variety of popular apps, turning Mailbird into a true all-in-one communication hub, combining Email, Messaging, Task Management, Calendar and Video Meetings in the most effective way possible for the user. Mailbird’s all-star developer team continues to add and improve these features requested by you. Think Mailbird needs a certain feature to convince you to switch? We have Mailbird Feature request forum where you can submit your request. Imagine working like a productivity machine through your email, while also being able to jump on a call without having to switch to browser or another software. It’s not just convenient but also way more efficient. In Mailbird, as the best alternative to Thunderbird, you have all your communication power tools in one place. Messaging Apps, like Facebook, Twitter and WhatsApp. Task Management, Apps and Tools like Todoist, Moo.do, Evernote and Asana, can easily be activated in your Mailbird AppStore. 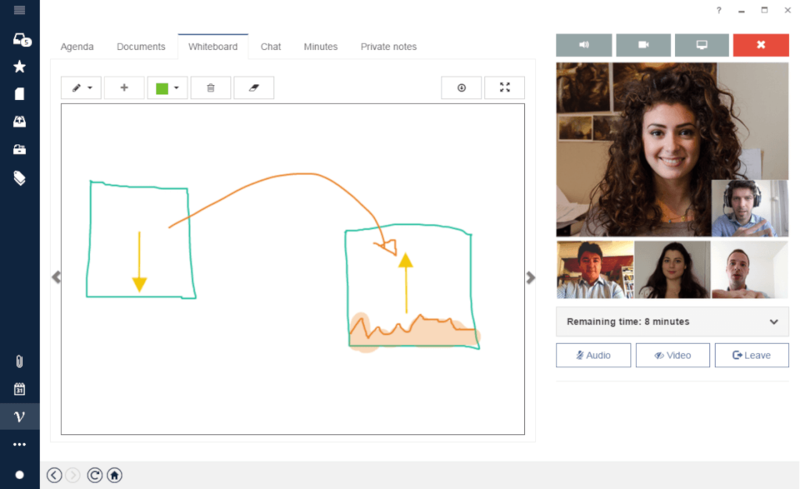 Video Meeting Apps, such as Appear.in and Veeting Rooms allow you to easily jump on a call or virtual Meeting, without having to leave your Inbox. 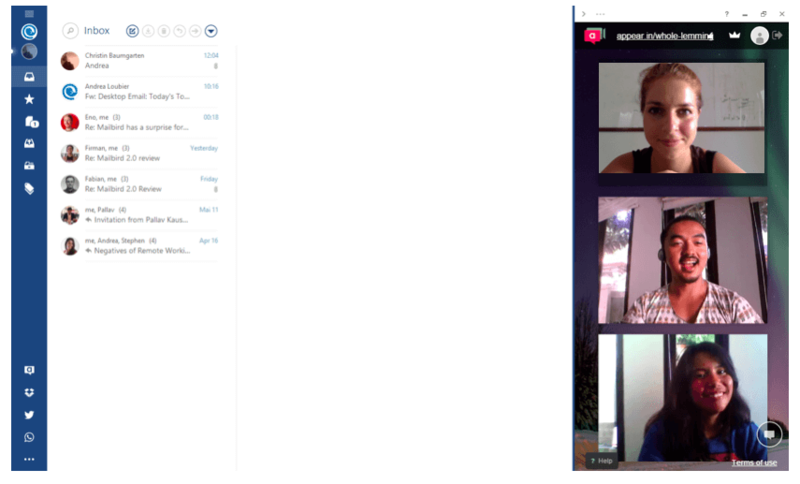 Veeting Rooms – Have a virtual Meeting without leaving your Email Client. 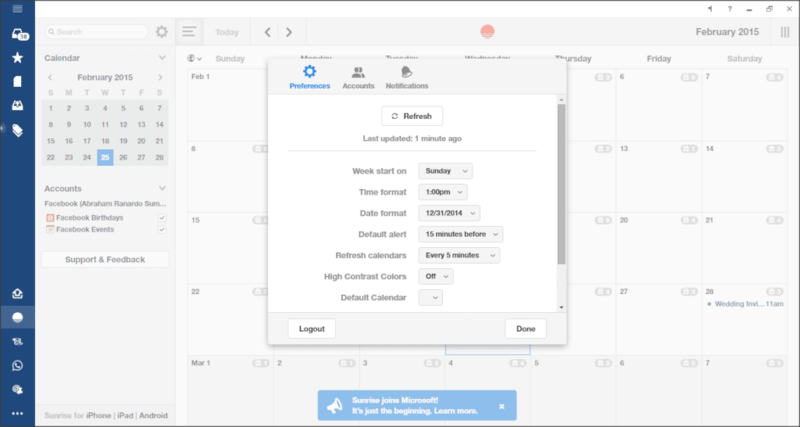 Calendar Apps, like Google Calendar and Sunrise Calendar give you a nice overview of your upcoming appointments and enable you to schedule appointments from your Mailbird. Sunrise Calendar – plan your day from your Inbox. Mailbird gives you a 30 day free Pro Trial when you install Mailbird for the first time. 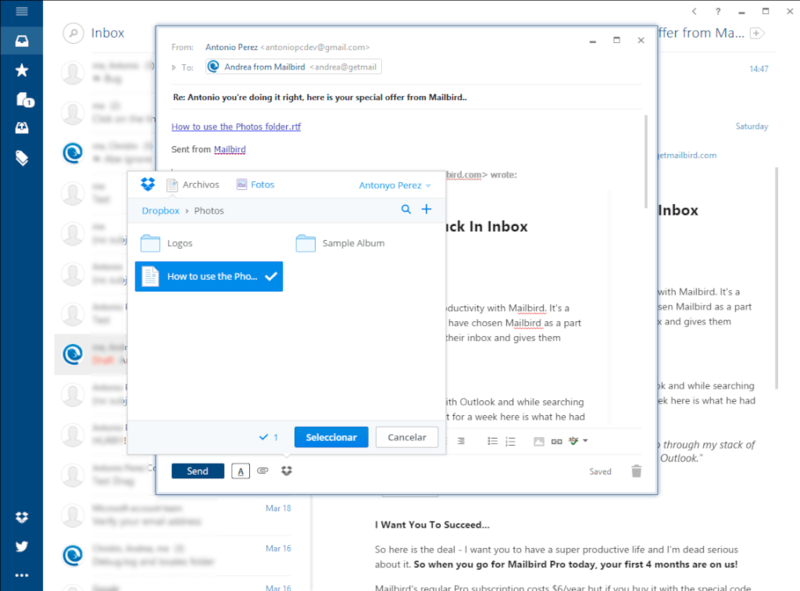 This is a great chance to find out why Mailbird Pro is worth that $1 a month. Still have questions before downloading it? Our team is always there to help you out. Shoot us an Email to [email protected] or tweet us @getmailbird. We are ready to help you and to answer every single one of them. That’s a great value that comes with Mailbird. Direct responses and feedback to help you through your email, communication and communication management needs. Ready to make the switch to the best alternative to Thunderbird? Simply start downloading Mailbird! You’ll just love it. Update: We have launched our Mailbird Import feature, that makes it even more simple to switch over from Thunderbird. Find all the details on how to “auto-magically” start importing your accounts here. 26 thoughts on "Why is Mailbird the best Alternative to Thunderbird in 2019?" Uh, so just to clarify, Mailbird only runs on Windows computers, right? Those of us who split our work and attention between Windows and Linux will need to continue using Thunderbird on our Linux machines? Well, I’m 66 years old, retired, and can do as I please. Before retiring I spent many years in the California State Service setting up PC systems, teaching people how to use them, and supervising staff who set up and maintained computer systems. The vast majority of those systems were Windows based and much of my work work [documentation and training] was done using Windows applications. But I also spent some time designing and developing applications based on Unix, the for runner of today’s Linux. Today’s Linux is much better than the older Unix system I worked in, just as today’s Windows 8.1 (soon to be Windows 10) is better than the Windows 3.1 I cut my teeth on. I just really like to keep up on the latest systems and take turns doing my work in both Windows and Linux. I find it a fun and interesting challenge. BTW, I have downloaded and installed Mailbird on my Windows side of my PC and am finding it really enjoyable. I even bought a yearly license for it. It is better than Thunderbird, but I will still keep using that product when I am logged in and doing work on my Linux side. Primarily so I can keep up with my flood of email without having to log out of Linux then log into Windows just to check my mail. Take care. Have a good day. Thanks so much for your feedback and even more for your awesome support! Have a great week and please let us know, if you ever come across any issues you may need help with. I am adding my comments because I too work with both windows and linux. I work in a shop that is total windows and use it at work. I like the updated features that linux kubuntu has and use it on my home computer. I move between the two because I was tired of paying Microsoft every year to get the new OS. Linux also updates twice a year so I have the latest features available. Linux does have a learning curve at first but the newest linux software is so much better now. I have moved from version 5.? too 18.10 and I have tried 19.04 so as you can see I have been using it for some time. Just thought I would put in my two cents worth. I’ve been searching for another mail client other than Thunderbird. I’ve tried 3 others and they just don’t compare. A feature I am in dire need of, that NO one else seems to have, is the Message Filter. I can set certain message to go to a specific folder, send straight to trash (those junk emails no longer bother me), and also auto tag/highlight so that I don’t miss them. and there is a whole list I haven’t even touched. I would love to give mailbird a try, but without that Message Filter option i will most likely switch back. Agreed, these new competitor can boast all they like about interfaces, integration and other fancy stuff but without portability and filter they are nowhere close to the lame old thunderbird. Batch operations wasn’t even working properly. What’s the use of your “8 different fancy layout” if the core functions was not even implemented properly. Tried it. Startup was easy enough, showed messages. I was happy. Then I tried to select 3 messages to delete them. Failed. Mailbird kept resetting my selections making it impossible to multiselect anything. Deleted those messages one by one. Worked with other stuff for a while, then noticed there was an email I wanted to read. Clicked on it. Clicked again. Clicked once more. Hmm, nothing. Decided to close the application. Noticed there was still an icon in the systray. Went there, rightclick, exit. It’s still there. Tried a few times more. Decided I’ve had viruses that act nicer than this, force killed it, uninstalled the software and I’m going to keep on looking. If only Thunderbird worked well on Windows 10. Or maybe I should just format and go back to Win7. That at least works. Like Tim I use both Linux and Windows, and I want to have access to my email from both. Is Mailbird well-behaved enough to share a profile with Thunderbird, or will I have to download my emails twice, each to its own data store? FWIW I use IMA4 extensively, but also NNTP and local folders in Thunderbird. My profile is close to 4GB in size and Thunderbird handles it just fine, but it might be a challenge for other program. I was going to try this but I am on Ubuntu, and with Ubuntu 16.04 coming out, Windows 10 is just a horrible product in comparison. Most people want security and safty on their computers and not hand over all their information to Microsoft including personal folders, and all emails which is what Windows 10 does. If this is offered for Linux I will pay for one year and try it thought. Hopefully they offer to pay in Bitcoin also. No Mac support is a show stopper for me, I wanted an alternative to Thunderbird, but if this is a Windows only program, it’s out of the running already. Pity, because it looks fantastic, just a shame that it’s not available on multiple platforms. I don’t think you can claim this is a thunderbird alternative until you can support at least two of the platforms it supports. I’m big fan of freeware, but 3 accounts in free version is a discriminating limitations that successfully prevents me to even try it out. Los primeros 3 meses ame mailbird, 6 meses después ya no estoy tan seguro. Con las actualizaciones no puedo visualizar de manera correcta los contenidos de los correos que me envian, desacomoda los correos y su herramienta de búsqueda deja mucho que desear al solo limtarse al nombre de las cuentas de correo electronico. Le di la oportunidad y promete mucho, pero llevo 6 meses esperando un cambio y ya me canse. Would very much like to use Mailbird but cannot risk not having certain backup. False. Thunderbird is receiving updates https://en.wikipedia.org/wiki/Mozilla_Thunderbird. And I quite like Thunderbird’s look, thank you very much. This UI looks good (it isn’t flat design, but still quite nice, IMO), but Thunderbird is hardly “difficult” to use. I haven’t needed dropbox, facebook, etc. integration. This does look nice, but I see no reason for me to switch, but I can see that others would like this much better. What’s up with your Thunderbird screenshot? Purposely low-resolution? E-mail opened up at the side for some reason? Cropped screenshot? If you’re going to screenshot both of them, at least give each a fair shot. How can any client that doesn’t have Linux and Mac support be called forward thinking? Very frustrating to not only have ads turn on WITH SOUND that distracts you and anyone in earshot, but to not get responses to questions tells me the company has Customer Service issues. Would love to have used them, but after several requests for answers and no response…over to Thunderbird I guess. Fail to see how the user experience is better. I have to manually delete spam messages as you have “still” yet to implement native spam filtering. Having a mark as spam option is an absolute shocker. Might as well just rename it click here it does nothing.